I was wondering if you can help me. I'm sure I read an article on the site a couple of years back, which told a story that Suzuki Roshi used to deliberately buy the bruised fruit or stuff that was passed the sell-by date. I found it really moving at the time, and I'd like to quote it or at least recount it in a column I am writing, but I can't seem to find it. I have a funny feeling it may have been written by someone famous, but can't be sure. Does it ring any bells? I loved Crooked Cucumber, made me cry my eyes out in places, I think you did a wonderful job. I loved your other book Thank you and ok, reminded me a lot of my time in Japan. 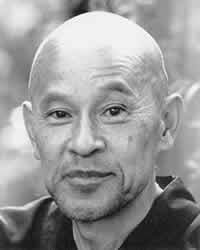 I'm a Zen practitioner living in London, having been introduced to it whilst an English Teacher in Japan. There's a copy of the first column here. Its going to be every two weeks. Hope all is well with you! Gassho. This story occurs over and over in my files and books. Next to the temple on Bush Street was a grocery store run by an old woman. Suzuki Roshi used to buy the old vegetables there. Finally one day the woman said, "Here are some fresh ones. Why don't you take them?" "The fresh ones will be bought anyway," he answered her. Brilliant David, thank you so much. I haven't read the book, will grab it soon, must have read it elsewhere. I like the way the story works almost as a Koan, it drills in and shows us a much deeper understanding of our relationship with the world, and the food in it. SOGAKU [Shunryu's father] made candles for the temple from an iron mold. He would pour extras, and when he had a good load he would walk five miles to Oiso City to sell them. On the way back he would pick up discarded vegetables from the roadside, storing them in a bag he carried. It wasn't just because he was poor that Sogaku did this. It was his way. His son would talk about it half a century later. There was a creek in front of my father's temple, and many rotten old vegetables would float down from higher up the mountain. Farmers and other people would throw them away. They were vegetable-like things, not exactly vegetables! [laughing] They might have been good for compost, not for eating. But as soon as he'd find them he'd cook them up and say, "Everything has buddha nature. You should not throw anything away!" Wherever he went, he talked about how valuable food is and how you shouldn't throw it away. Suzuki's favorite story about his novice days with So-on was a cautionary tale, not of selfishness but of discrimination, and of pickles gone bad. At Zoun-in pickles were made to eat year-round but especially in the winter, when there were few fresh vegetables. There were pickles made from cucumbers, carrots, eggplants, cabbage, and daikon, the giant white radishes. A batch of takuan, daikon pickles, had been undersalted and had gone bad. So-on was told about it. He was just like Sogaku when it came to food. He wouldn't throw it out. "Serve it anyway!" he ordered. So for meal after meal decomposing daikon were served, and the pickles were getting worse with the passage of time. One night when they could take it no more, after they were sure So-on was asleep, Shunryu and a couple of cohorts took the pickles out to the garden and buried them. The boys were pleased with themselves, thinking they had gotten away with their prank. But a few days later when they sat down for breakfast at the low wooden table, So-on brought in a special dish—the rotten pickles back from the dead! So-on ate the pickles with them. Shunryu gathered his courage and took the first bite, then the next. He found that he could do it if he didn't think about it. He said it was his first experience of nondiscriminating consciousness. If we have surrendered to our master, we employ all our effort to control our mind so that we may exist under all conditions, extraordinary and ordinary. Food had become scarce. The soldiers and Korean laborers cooked for themselves and were better supplied. Much of the nation's rice was going to the troops; the Suzukis and their guests subsisted by foraging in the woods and growing food in the temple garden. The garden had been inspired by the sweet potato crop at a nearby little Soto temple called Zuioji, run by the Sugiyamas. One day after returning from Zuioji, Shunryu went out and started removing stones from a plot below the temple. Soon the caretaker and some villagers were helping. They put in manure and built a fence to keep animals out. They had a good crop of sweet potatoes, pumpkins, cabbage, and a variety of other vegetables, though it was never enough. Yasuko and some of the other children would go with Tori and Chie up into the mountains and return with chestnuts, acorns, and locusts. Anything edible was a treat; there was no concept of three meals a day. Most civilians were willing to eat less so that the soldiers in the field had more. In this way they were fighting the war too. In that spirit Chie would feed Shunryu's students before her own family. The children saw every wild berry as a contribution to the war effort. They believed in the divinity of the emperor, saluted the soldiers, and thought the war was a righteous and winning cause against white devils. Even nine-year-old Yasuko thought that way, and it would have been futile for her parents to try to contradict the propaganda she absorbed at school. Shunryu would go out with his begging bowl on takuhatsu, a practice that was no longer merely ceremonial. Without looking up from his conical begging hat, he would receive food and small change while chanting verses for the donors. On these walks he would stop to help workers dig ditches for refuge in air raids and would plant cucumbers and eggplant around the edges. The American soldiers came and proved not to be devils. The Japanese forces were allowed to disarm themselves, and the Japanese civil authorities were given the power to administer the nation under the watchful eye of GHQ, General Headquarters, the American army of occupation. But there was a new war: the enemy now was starvation. Food was scarcer than ever, and the harvest had been poor. Temple life was just as hard as in the days of Haibutsu Kishaku, the nineteenth-century persecution of the Buddhists, except now everyone suffered. One morning a neighbor came to Rinso-in to help out in the kitchen. Shunryu brought in some vegetables from the garden, and there was seaweed and miso for soup, but when the woman opened the large temple rice box she gasped. It was empty. Her family didn't have much either, but she ran down the hill, took half of what they had, and gave it to the temple. Soon all the neighbors and members of Rinso-in heard that the temple was in need, and the rice box filled up. The homeless, the jobless, and the hungry were wandering the roads, and some found their way to Rinso-in. Shunryu would see them coming and tell Chie, "Look after them." She would share what they had—cooked rice, sweet potatoes, pumpkins, cucumbers—and admonish them to go find work and take care of themselves. Just as Chie was giving it away, some old woman with a bag of rice would come down the mountainside to make an offering to the temple. The temple rice box had a life of its own. As he walked to Rinso-in, Taro Kato collected locusts and strung them together with needle and thread. At Rinso-in he cooked them with soy sauce. Another example of her husband's impracticality led Okusan [his wife] to insist that she do the grocery shopping. He would sometimes drop by the market on his way home to purchase vegetables, especially his favorite, sweet potatoes. The problem was that he would choose the oldest, most wilted and damaged vegetables. She would ask how in the world he could pay money for such produce. He'd say he felt sorry for them. She had even found him on the street picking up Chinese cabbage that had fallen off of the delivery truck—echoes of his father. JB: I remember a lot about him. His example just helps me make my way through life. I remember his maxims and things he said at different times like Old Ladies Mind and Crooked Cucumber and the story about him at the corner grocery store [choosing the oldest vegetables because he felt sorry for them]. Here it is from an interview with Yvonne Rand I just put on cuke.com - it's at the very end. YR: Remember that grocery store on the corner? He'd buy the funkiest vegetables because he felt sorry for them, and when vegetables would fall to the street from the grocery trucks he would run over and rescue them - even if they'd been run over. And he also said he got the old ratty vegetables that nobody else wants because if he doesn't buy them who will and then they would have lived in vain. BW: If he was shopping in a market for fruits or vegetables he would be likely to take a damaged one -- feeling sorry for it or wanting to use it. Goes with his humility. Suzuki had conceived the distinctly naive hope of turning the most dedicated of them into missionaries who might reform the jaded, politically compromised practice of Zen back in Japan. That dream lay behind his wish to establish the training monastery that became Tassajara. But the unworldly Suzuki—who, his wife once reported, would return from a market with the most damaged and wilted vegetables, because he felt sorry for them—failed to anticipate the strains that such a major expansion would produce.